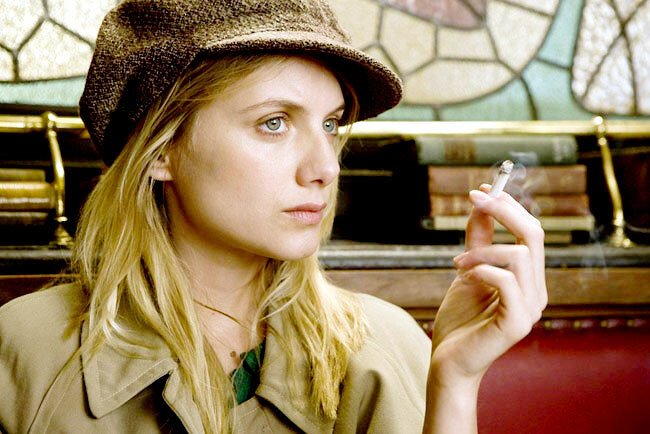 Posted on 01/15/2010 by Glenn B.
Mélanie Laurent’s character were scarcely even mentioned in the American marketing for this film, so I was quite surprised when her subplot became the most compelling one in the film. Following the deaths of her family at the hands of the SS, Shosanna bides her time incognito as the owner of a Parisian cinema, and plots revenge. As I mentioned in my original review, Shosanna is a familiar character, seemingly drawn from the same well as The Bride from Kill Bill, but Laurent ably makes this character her own, combining a quietly sorrowful demeanor with an unflinching vendetta. Shosanna is also part of an entirely one-sided “romantic” subplot with a German soldier (Daniel Bruhl)… While his advances aren’t terribly entertaining, her constant rebuffing is occasionally comedic, but mostly downright chilling (“I suggest you try Vichy”). There is also a remarkable scene between Laurent and Christoph Waltz, in which they sit in a Parisian restaurant and eat strudel. As Shosanna faces the SS Colonel, she manages to rein in her terror until he steps out, at which point she immediately starts hyperventilating. Laurent’s performance is ruthless – like so many others in this film – but also quite vulnerable. She brings just the right balance to keep Shosanna sympathetic, even as she commits atrocities on par with the very people she wants to kill. It is a fantastic performance to round out an almost entirely strong cast (I’m lookin at you, Eli Roth), and is certainly one of the most memorable this year. This is a performance I really have to take James Cameron’s word on. The various forays into CG characters over the past decade have definitely started to blur the line between animation and live-action, but they were still mostly in the realm of bodily motion capture, with complex facial expressions significantly enhanced in post-production by teams of skilled animators. But while Andy Serkis’ performances as Gollum in Lord of the Rings were not eligible for an acting Oscar, they were a leap forward from the likes of Jar Jar Binks, and Avatar is certainly the next such leap. According to Cameron, the characters in this film were created using performance capture techniques that recorded every nuance of the actor’s performance. Every tic of a facial muscle…every movement of the eyes… They were all made by the real actors. If this is really the case, it is entirely possible that future performances in this vein will be eligible for acting awards. And I would certainly hand one out to Zoë Saldaña. 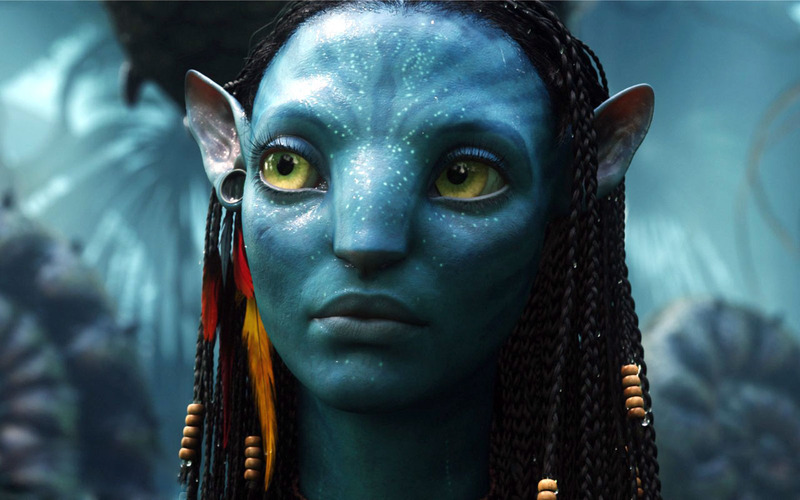 Neytiri, the Na’vi princess, is just about the only sympathetic (or fully realized) character in this film, and Saldaña plays her with an some surprisingly animalistic ferocity (even baring her teeth and hissing a few times). While the visual spectacle of this film was enough to ensure that I was rapt with attention, it was with Saldaña’s character that I made the greatest emotional connection. She is almost certainly responsible for how well the romance played on-screen, and in light of the complex production process, achieving any believable chemistry could not have been an easy feat. Natalie is a fascinating character – the consummate young career gal, ruthless and cynical, but with a very human side, full of all the self-imposed deadlines and anxiety about her future that all twenty-somethings tend to have. Anna Kendrick, who I’d only seen previously in a small and ineffectual role in the Twilight films, gives a masterful performance as Natalie, and is surely one of the actresses I’ll be watching for in the future. This is a performance that grew on me each time I saw the film. The interplay between Natalie and her colleague Ryan Bingham (George Clooney) is simply fantastic. Kendrick plays the character with both a fierce determination and a striking vulnerability, utterly immune to Ryan’s charms (and soundly mocking him for his rhetoric). As their road trip of job terminations goes on, it all becomes more and more personal for Natalie, and Kendrick’s performance completely brings this transformation to life. This is a haunting performance in a strange and thoroughly disturbing film. Charlotte Gainsbourg plays the unnamed wife of a couple grieving alone in the woods. Through this unsettling and bewildering performance, Gainsbourg effectively conveys how broken and terrified this character has become. The interplay with her husband (Willem Dafoe) effectively illustrates the disjointed and counterproductive state of their present relationship. Gainsbourg’s performance is utterly fearless, and she maintains it even as her character becomes a paragon of the film’s unrelenting misogyny (“A woman crying is a woman scheming…”). Frankly, I would have a hard time recommending this film to anyone, but if I did, it would be solely because of this performance, which is one of the most effective and frightening I’ve ever seen. Zooey Deschanel…steals this film. To put it bluntly, this is a character that the audience could easily have ended up despising. And while the character of Summer is mostly well-written, the characterization and non-linear progression of the story demand a great deal from Deschanel. And it is her performance that just manages to make the character sympathetic. As Tom reflects on his relationship, many of his scenes with Summer are cast in a different light through subsequent flashbacks. On the second run through, the film’s editing calls attention to the slightest glance of the eyes, or twinge of the cheek muscles, or the most minor apathetic tone of voice… In each of these microexpressions, Deschanel’s performance is masterfully subtle. And throughout the film, she brings all the mystery, likeability, and sensuality that the character demands, but couples it with a subtle undertone of cold, mature pragmatism. She manages to force the audience through nearly the same process as Tom, despite our advantages of an outside perspective and sardonic narrator to keep us objective..
Click here to see the rest of the 2009 Glennies. This entry was posted in Glennies, Uncategorized and tagged 500 Days of Summer, Anna Kendrick, Antichrist, Avatar, Awards, Best Actress, Charlotte Gainsbourg, Inglourious Basterds, Mélanie Laurent, Movies, Top 10, Up in the Air, Zoe Saldana, Zooey Deschanel. Bookmark the permalink.